Gophers and prairie dogs seem like similar animals, and in many ways they are -- they are both rodents, and they both burrow in the ground, but many differences distinguish these animals. The gopher family, Geomyidae, contains 35 species in five genera. The five prairie dog species occupy a single genus, Cynomys, within the squirrel family. 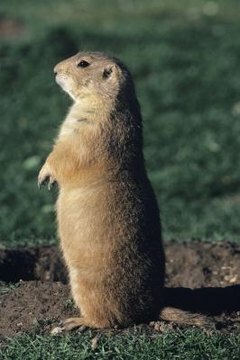 Gophers are typically much smaller than prairie dogs. Most prairies dogs are about the size of rabbits, weighing between 32 and 64 ounces on average, while the average gopher only weighs between 3 and 5 ounces. Prairie dogs grow to between 12 and 15 inches long, while gophers are typically around half that length. Unlike prairie dogs, gophers have no distinct neck and have pouches in their cheeks used to store and transport food. The two animals can also be distinguished by their tails: a gopher’s tail is hairless, contrasting with the bushy tail of a prairie dog. Throughout Central and North America, gophers live in all sorts of habitats, provided there’s enough vegetation to feed them and they’re able to dig in the soil. Prairie dogs are more specialized, living in prairie and open grasslands in North America. Gophers carefully plug the entrances to their burrows to control the temperature and moisture level inside and to keep out light and other animals. Prairie dogs leave the entrances to their burrows open so they can come and go. Gophers eat mostly tubers and the roots of other plants. Prairie dogs eat these as well, but they also feed on grasses, weeds, blossoms and seeds above ground. Gophers eat from inside their burrows, pulling their food down from below. In contrast, prairie dogs emerge from their burrows each morning and spend most of their day foraging for food on the surface. The social prairie dog lives in family groups that cooperate, sharing food, grooming and protecting each other from predators. The black-tailed prairie dog, for example, lives in large networks of burrows called “towns” that can cover hundreds of square miles. Gophers are solitary creatures and come together only to mate. They reproduce year-ound, in contrast to prairie dogs who have a single annual mating season each spring. Gophers spend nearly their entire lives below ground, coming to the surface only rarely, whereas prairie dogs spend most of their waking hours outside their burrows, retreating to their dens to rest or when threatened by a predator.